Move your training up a gear yet stay feeling cool and refreshed as you workout with the New Balance 7 Inch Shift Training Shorts in Black. 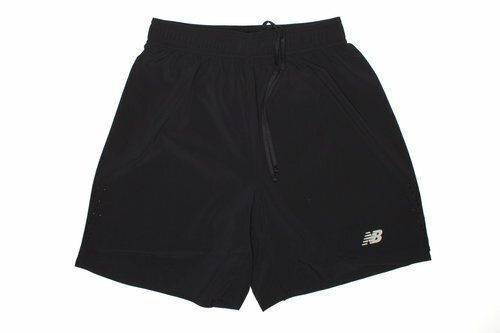 These men's training shorts from New Balance have a plain loose fitted design and include an elasticated waistband with interior adjustable drawstrings for a secure and comfortable fit. A zipped side pocket allows the wearer to safely keep hold of their valuables whilst they train. Made from polyester and elastane material, these shorts include NB Dry technology which is designed to help keep the wearer feeling drier and more refreshed as they exercise by wicking sweat away from the skin and quickly drying off. Air holes on the legs brings improved ventilation for a cooling effect. Ready for action in the gym, out on the pitch or on a run, make sure you've got a pair of these New Balance 7 Inch Shift Training Shorts in your kit bag.